LADDER leaders Sorrento Sharks succumbed to Bonbeach in a shock loss at home this Saturday in wet and windy weather. Bonbeach, who have struggled with inconsistency all through the season, had to endure a fast starting Sorrento in a first quarter that saw Bonbeach only register two scoring shots to their opponent’s 12. Sorrento were wasteful in front of goal however, and could only register two goals and 10 behinds to keep Bonbeach in touch. Bonbeach capitalised on Sorrento’s wasteful form in front of goal in the second quarter, as they established a nine-point lead going into the half-time break. Given the horror conditions, both teams were struggling to put goals on the board, which ensured the contest remained even right through to the final siren. Although Bonbeach could only manage one goal in the second half, they managed to hold on their lead to claim an important victory over Sorrento 4.15 (39) to 6.11 (47). The loss sees Sorrento lose their firm grip on top of the ladder, as Edithvale-Aspendale are now only behind them on percentage following their impressive win over Seaford. 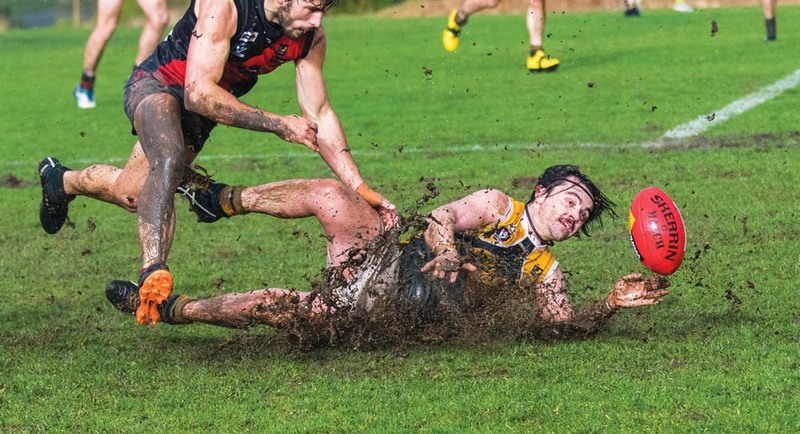 Edithvale-Aspendale also endured a difficult start and failed to adapt to the tough conditions, as they kicked seven straight behinds in the first term and went into the first break trailing last place Seaford. 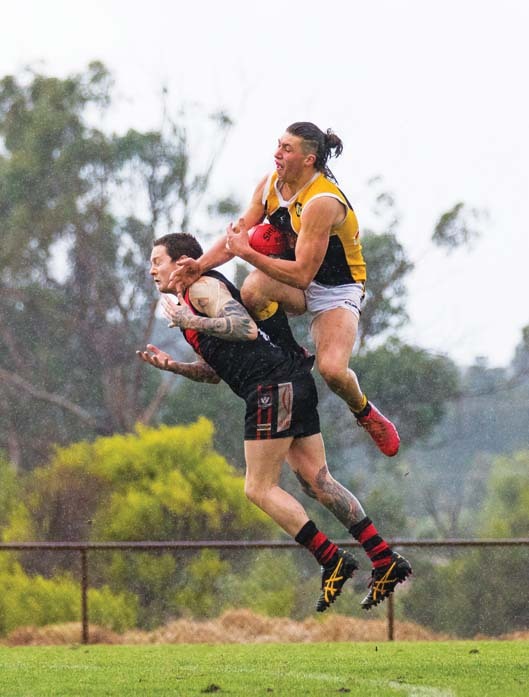 Edithvale-Aspendale quickly recovered from their sluggish first quarter and established a lead in the second term that they would hold onto for the rest of the day. Seaford couldn’t keep up with the quality of their opponents and eventually fell to Edithvale-Aspendale 8.20 (68) to 5.6 (36). Sam Monaghan and Michael Bussey were again amongst the best performers for Edi-Asp, who could claim top spot on the ladder should Sorrento slip up again in the coming weeks. Both sides sit at 10 wins and three losses going into the last month of the home and away season. At Greg Beck Oval, Frankston YCW were faced with a do or die situation as they looked to beat the Frankston Bombers claim their first win in six weeks. Since their victory over Mornington in Round 6, Frankston YCW have yet to claim a single win, and would shockingly drop out of the top five if they failed to secure a result over their Frankston rivals. The Bombers had the best of the early opportunities, as they dominated the inside 50 count and looked much the better side. Despite having all the momentum, the water-logged ground made it difficult to capitalise, and the Bombers only went into the half-time break with a narrow two-point lead. With the Stonecats battling hard to fight their way back into the game, the game looked set to go down to the wire. Only two goals were kicked in the second half, but the tough, contested football saw the rabid Frankston crowd on the edge of their seats. When the final siren sounded it was the Bombers who held onto a slim lead, as they claimed victory over the Stonecats 5.11 (41) to 5.5 (35). The loss sees the Stonecats slump to sixth on the ladder, unchartered territory for the side that has dominated the league for so long. They will have a bye next weekend, which will allow them a chance to rest and regain some key names. YCW’s Byron Barry and Christian Ongarello were impressive against a relentless Bombers outfit, as they were able to provide consistent rebound to give their side a glimpse of hope. Jason Kingbury, Dale Sutton, and Matthew Harris were the best performers for the winning side. At Olympic Oval, Rosebud played host to Pines in what would turn out to be a miserable afternoon for the home team. Pines got off to an impressive start and took a twenty point lead into the first break, and Rosebud wouldn’t come close to catching up. Pines’ defence held strong and only conceded three goals for the whole afternoon, as they ran out as convincing 3.8 (26) to 11.12 (78) winners. Aaron Edwards kicked another four goals to take his tally for the year to 38 from 11 games. Most teams will enjoy a week off next week, with Seaford and Rosebud at Belvedere Reserve being the only MPNFL Division One action for the weekend.